Yahoo's Black Monday Begins With Shares Down 20 Percent. 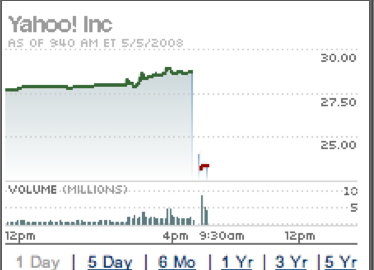 How black will today be for Yahoo’s shares? Following Microsoft’s withdrawal of its takeover offer on Saturday, shares of Yahoo took a 20 percent hit after the market opened this morning, opening at $23.02 (from Friday’s close of $28.67) but then started to edge up. That’s still well above the $19 per share that Yahoo was trading at when Microsoft originally made its offer three months ago. If shares continue to drop, this could turn out to be a rough day for Yahoo shareholders. However, if the shares don’t drop much further, that could mean Wall Street is still pricing in another takeover attempt from Microsoft or someone else, or perhaps a Google advertising deal. How low can Yahoo shares go, or is that it—a $5 drop? Update (1PM ET): The stock seems to be holding up pretty well at midday, down less than $4 from Friday’s close. Update 2: The stock closed today at $24.37, down 15 percent. Not as bad as expected.